It’s Black History Month and I am happy to partner with other amazing black food bloggers for this year’s Black History Month Virtual Potluck! If you missed out on last year just wait and see what everyone is doing this year! This year I chose to share a recipe that is dear to me, Creole Mackerel Balls w/ Biscuits. Growing up this was a dish my father use to make my brothers and I.A meal that his father would whip up for his brothers and sisters. Which I am sure this is a meal that his father had growing up and stuck with him, which in turn became a dish my father loved, which then lead to him passing it down to us. Till this day every time I make this dish I think of my childhood. The canned mackerel that he would carefully take the bones out and flake up gently making sure to keep the meat in tact. The big blue Pillsbury can of grand biscuits that went into the oven. And you cant forget the Aunt Jemima pancake syrup and hot sauce on standby. Believe it or not, this was something that we never had at breakfast. For some reason it is a meal that my brothers and I would enjoy for dinner—and it was a good meal at that. Like anything that is passed down, you tend to add your spin to it. My dad would grate raw potatoes into the mackerel mixture, making sure to drain the liquid—something he said his father didn’t do. But for my take on it, I decided to boil the potato which in turn eliminated the chance of the mixture becoming extremely wet. It also helped with binding everything together. But, the best thing about this technique is that when you fry your mackerel balls, the roughly chopped potatoes that makes their way on the outside develop the most wonderful hash brown like crust—it’s amazing! More of the texture comes from rolling your mixture in cornmeal instead of flour for a welcoming crust. Warm syrup, hot sauce and biscuits brings everything together for the most satisfying simple meal. Serve with your favorite can of biscuits or biscuit recipe. Bring a small pot of salted water to a boil, add potato and cook until fork tender. Remove from water, peel off skin and rough chop. (Then can be broken apart into pieces or diced). Place aside and let cool. In a small skillet over medium heat, add your butter and onions. Let it sauté for 3-4 minutes. Toss in the celery, green onions, garlic and creole seasoning. Cook for another 3 mintues, let cool. Open up your can of mackerel and dispose of the bones. Gently flake the meat and add to a bowl. Add in the cooked veggies, parsley, hot sauce, creole mustard, kosher salt, cornmeal, potatoes and the egg. Gently incorporate all ingredients and form into a ball or patty. Place in the refrigerator for 20 minutes to chill. In a cast iron skillet heat the oil over medium high heat. Combine the cornmeal and creole seasoning on a plate and place aside. Remove mackerel balls from the refrigerator and roll/coat with the cornmeal mixture. Place in the skillet and pan fry for 3-4 minutes on each side until golden brown and you achieve a great crust from the cornmeal. 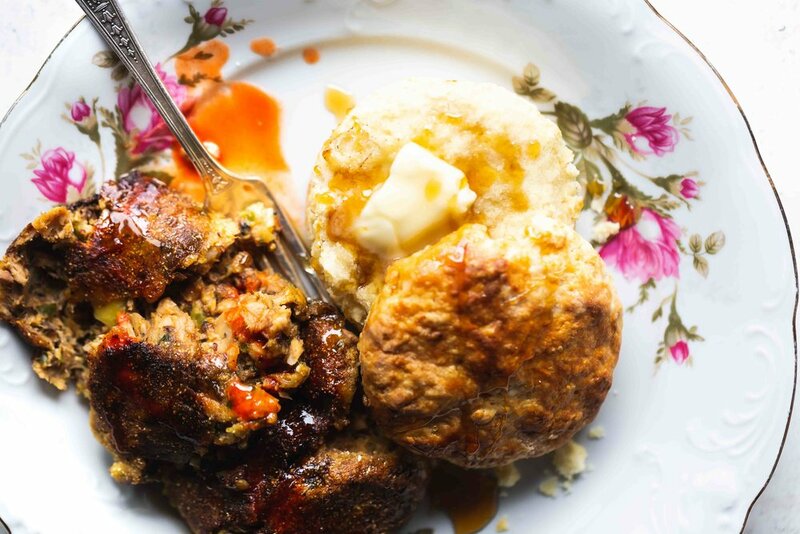 Serve with hot biscuits, cane syrup or syrup of choice and hot sauce! Citrus season is in full effect and I am celebrating with some local citrus I received from one of my favorite shops in Downtown Mckinney. It’s only fitting I make one of my favorite things, a shrub! A refreshing concentrated syrup that contains your fruit of choice, sugar and vinegar. They are perfect mixed into cocktails and also with club soda. The great thing about shrubs and cooking in general is for the most part is it is about preference. Particularly for shrubs I love to use a mild vinegar to not overpower the shrub, so I usually go for a coconut vinegar or apple cider vinegar. For this citrus shrub I used bold spices such as star anise, cinnamon, clove and black peppercorns. Some warmth from vanilla beans and sugar. Ratios for shrubs really vary on preference. Usually you will find an 1:1 ratio. As far as methods go, I prefer the cold method, so I macerate my fruit of choice in sugar, any herbs and spices on the counter top and let it ferment overnight. After that, I add in my vinegar and taste until it has the zip I am looking for. 3 cups of large oranges srubbed and rough chopped. In a skillet, toast the spices until fragrant. Add in a large bowl the toasted spices, oranges, sugar and vanilla. Combine really well, cover and place aside for up to a day on the countertop. Add in coconut vinegar, 1/4 cup at a time. Taste and see if it is to your liking. Cover and let it sit for up to a day on the counter. Strain into a container and store in the fridge. To serve add to some sparkling water or club soda—adjust to your liking and enjoy! In a cocktail shaker with ice, combine all ingredients except the maraschino cherry. Shake until cold, strain into a glass and garnish with cherry. Yes to these chocolate chip and peppermint cookies! I have been testing out different cookie recipes and these were a hit! Y’all, I am not a baker but up until I made these cookies I have only made cookies from scratch twice in my life! I really wish someone told me how easy it was. On top of being quick to put together, they freeze well! Yes, you can have mountains of cookies in your freezer at you becoming. Rich chocolate and minty peppermint is the perfect combo! I was at one of my local grocery stores here in Dallas and they have Valrhona chocolate on sale, so me being me, I had to get some! Valrhona chocolate is a staple in professional kitchens across the world. Such great quaility, so when I saw them on sale, I had to grab some of their Guanaja 70%, which is the perfect balance. When I first made cookies, I just used regular AP flour. But after some reading and studying of recipes, a lot of them called for a mixture of both AP flour and bread flour. Bread flour has more gluten which in turn will add more texture and a chew to your cookies. Also, if Christina Tosi from Momofuku Milk Bar fame recommends it, then it’s a no brainer. Here is a link from Food52 that talks a little bit more about using bread flour and also some more awesome tips and tools. 1	In bowl of a stand mixer fitted with paddle, cream butter and sugars. 2	Add eggs, one at a time. 3	Reduce speed to low, add flours, baking powder and soda, and vanilla. Mix until fully incorporated. 4	With the speed on low, add chocolate and stir until mixed. 5	Using an ice cream scoop, portion dough. Rest in refrigerator for at least 24 hours. 1	Preheat oven to 350°F. 2	Place dough evenly onto a lined baking sheet. 3	Sprinkle with sea salt and place directly into center of the oven. 4	Bake until lightly browned, about 20 minutes for larger cookies, 15 minutes for smaller cookies, turning entire tray 180° during baking. Cranberry orange pop tarts are a must. Wow it has been a while since my last post. I must say that I have really missed this space. Even though I do not consider myself a writer, it is great to gets things out. Being consumed with work has left me to do a lot of thinking and refocusing. Making sure to make time for things that I enjoy—instead of just work, work, work. So, here I am with a new tasty recipe for ya’ll to try. Holidays are here at full steam and I have the perfect sweet for you to make, cranberry filled pop tarts! With a hint of orange because, it is the perfect pairing. Adulting all the way with these cranberry orange pop tarts! I remember sneaking boxes of pop tarts into the basket while my parents shopped. My brothers and I would always fight over them and then found out that they are also tasty without being zapped in the toaster. Still trying to cook out of my comfort zone, I choose cranberries because I hardly cook with them. I am trying to incorporate ingredients that I would not alway grab or cook with. The only form of cranberries that I am familiar with during holiday time is the one the comes in the can. But me being me, I cannot resit making something from scratch. Freezer friendly—especially if you do not want to indulge in the whole batch at once. The cranberry jam filling is so easy to make. A little fact, cranberries contain A LOT of pectin—so it doesn’t take a lot of sugar to reach a gelling point—but cranberries are pretty tart, so you will need to adjust to your taste buds. I added freshly squeezed orange juice and orange zest into the liquid which is just fresh cranberries, juice and zest from one orange and sugar. That.Is.It. The pastry dough is a recipe from King Arthur Flour which worked really well and I can’t wait to use again. Leftover jam made for the glaze, powdered sugar, milk, cranberry jam and orange zest made for the perfect glaze. Place one piece of the dough on a generously floured work surface, and roll it into a rectangle about 1/8" thick, large enough that you can trim it to an even 9" x 12". Trim off the edges; place the scraps on a baking sheet, and set them aside, along with the 9" x 12" rectangle of dough. Roll the second piece of dough just as you did the first. Press the edge of a ruler into the dough you've just rolled, to gently score it in thirds lengthwise and width-wise; you'll see nine 3" x 4" rectangles. Beat the egg, and brush it over the entire surface of the dough. Place a heaping tablespoon of filling into the center of each marked rectangle. Place the second sheet of dough atop the first, using your fingertips or a chopstick to press firmly around each pocket of filling, sealing the dough well on all sides. With a fork, press all around the edge of the rectangle. Cut the dough evenly in between the filling mounds to make nine tarts. Press the cut edges with your fingers to seal, then press with the fork again to seal. Gently place the tarts on a lightly greased or parchment-lined baking sheet. Prick the top of each tart multiple times with a fork; you want to make sure steam can escape, or the tarts will become billowy pillows rather than flat toaster pastries. Sprinkle the tarts with cinnamon-sugar, if desired. Refrigerate them, uncovered, for 30 minutes. Remove the tarts from the fridge, and bake them for 30 to 35 minutes, until they're a light golden brown. While pop tarts bake, make the frosting. Combine all ingredients into a bowl and whisk together until smooth and creamy. Place aside. Remove pop tarts from pan and let cool. Drizzle frosting all over. When I think of the Fall, I think of cozy foods and what’s better than a nice plate of pasta. This recipe for pumpkin tortelli came from a book that I dream of mastering, “Flour + Water: Pasta” by Thomas McNaughton. It is a book I’ve had for a while and have made a few pasta recipes from—always on point and delicious. So, here is another one, that i’m sharing and perfect for all of the pumpkin we will be consuming in the next few months. This recipe calls from pumpkin puree and some warm spices. I used cinnamon, allspice, cane syrup and some grated parmesan cheese for my filling. The dish is finished with some freshly chopped sage, toasted walnuts, balsamic reduction and shaved parmesan cheese. A note on making pasta, have fun! I truly is a fun process and relaxing. I use to beat myself up when it didn’t come out right or I did not roll it through the machine with precision and ease. As I continue to make pasta and attempt recipes, the more comfortable I’am getting. One thing I learned about cooking is to have fun! Have fun and share your delicious food you created with those you love and care about—it makes it even more rewarding. Heat a sauté pan over medium heat and add the butter. Once the butter has melted, cook, stirring constantly, until the butter becomes a light tan color; it should have a nutty aroma.In the container of a blender, add the pumpkin, brown butter, cinnamon, nutmeg, vinegar and cane syrup. Puree until smooth and season with a pinch of salt. Spoon the mixture into a bowl and fold in the parmesan cheese. Cool down and place aside. Dust a baking sheet with semolina flour and set aside. Roll out your pasta dough and cut a 2-foot section of the dough sheet. Make sure to cover the rest of the dough with plastic wrap.With a straight wheel cutter, half the pasta sheet lengthwise into two 3-inch wide strips. Using a piping bag or spoon, place 1 1/4-inch logs of filling in the middle of each strip. Keeping an inch of separation between each log of filling. Fill both strips.Gently fold the dough over the filling, bringing the two edges together to completely cover the filling. Use a spritz of water from a spray bottle to help seal it if necessary. Using your thumb, seal the top edge of the pasta, but just the very edge. To form the individual tortelli, start on the right side of one strip and press down along the pasta with your index finger, sealing the pasta and pushing out all the air. Make sure you create a tight capsule of dough around the log of filling. Move down the line, pressing down around one log at a time.Using a flutter cutter, trim the edges, leaving 1/4 inch of pasta between the filling and the cut. Working quickly, place the tortelli, on the prepared baking sheet. Don't let the touch each other or they may stick together. Repeat until you run out of dough.Bring a large pot of water to a boil. Heat a sauté pan over high heat and add the butter and salt. When the butter starts to bubble, add the walnuts and stir to incorporate.Drop the pasta in the boiling water. Cook for 2 to 3 minutes and then add it to the pan with the walnuts and butter. Add a few tablespoons of pasta water and increase the heat to high. When the pasta is tender, add the chopped sage and toss. Serve with freshly grated parmesan and balsamic reduction. Beet cured salmon gravlax! Coming right at you! I love trying new cooking techniques and this beet cured salmon gravlax is something that have been on my list of things to make. I am so glad I did! It was fun seeing it come together and even more fun eating it. The curing technique for this is pretty straightforward--curing food goes back hundreds of years. Salt and sugar draws out moisture from the salmon and the added aromatics flavor the meat in the process. Slice it thinly on some toasted bread, serve with some scrambled eggs and you are good to go. Make this for the uncommon holidays and wow your guest! What cooking techniques or new foods are you looking to make? Rinse the fillet and dry it with a paper towel and lay it on a piece of parchment paper. Remove any pin bones and set salmon aside. Cover your cutting board with a layer of plastic wrap so it doesn’t stain from the beets. With a grater, grate the raw beets on the biggest holes on a box grater. Gather up the grated beets in the plastic wrap and transfer them to a food processor. Add the sugar, salt, juniper, and peppercorns to the food processor. Pulse mixture 7-10 times in short spurts until mixture begins to look uniform and sandy. Transfer the beet mixture to a mixing bowl, add the lemon zest, dill, and tarragon, mix well with your hands. Splash the gin across the flesh and the skin side of the salmon and make sure to smooth it all over the salmon. Place the salmon flesh side down, onto the the parchment paper. Spread half of the beet-salt mixture evenly over the salmon. Flip the salmon over, skin side down, on top of the beet mixture and pack the remaining beet-salt mixture across the flesh side of the salmon. Fold up the edged of the parchment paper toward the salmon and then fold the bottom side over the top. Wrap the entire salmon package in several layers of plastic wrap (must make sure it is sealed very). Lay the salmon on a rimmed baking sheet (make sure the baking sheaths at least 1/2-inch sides, as a lot of liquid will escape). Place another baking sheet on top and top the second sheet with any object or objects weighing a total of about 5 pounds. Refrigerate the weighted baking sheets for 16-18 hours. After that time, flip the salmon over, then reweigh it and refrigerate for another 16-18 hours. Open the salmon package and brush away the excess beet-salt mixture, reserving the mixture in case you find you need to continue curing the salmon for a few more hours. The salmon is ready when it springs back gently when you touch it. If it is extremely hard, it is over-cured. If it is too soft, it had not cured long enough. Best way to know if it is ready is to cut a thin slice and taste it. When fully cured, rinse the salmon with water and pat dry with paper towels. Lay the salmon on the cutting board and slice horizontally between the skins of the salmon and the flesh to separate the two. Do not remove all of the salmon from its skin, slice only about 2 inches deep. Serve with eggs, pasta, toast or fold into some delicious cream cheese. Yes! You read right, salted caramel apple pie! It's pie season--or can it be pie season all your round?! Regardless, this pie will change your life. Period. Tender apple slices, buttery pie dough all layered with salted caramel goodness. This recipe I have been eying forever. Slowly but surely, I'm beginning to love baking and making pastry. Check out my lattice! Still a long way to go but I was super happy with it. A lot of recipes I tried, the dough just didn't hold together--but I found the perfect recipe and cannot wait for y'all to try it out. Thanks to Rachel over at Two Loves Studio for the recipe! Another new technique I tried with this caramel apple pie was cooking the apples first. Once I laid my attic over the pie, I did not want my filling to shrink and leave a big gap. So, I cooked the apples first with the spices and thickeners, let cool, and then added them to my prepared pie dough. This recipe was inspired by four and twenty salted caramel apple pie and the salted caramel sauce from my go to cookbook, Taste and technique. Heap the flour onto a clean surface and make a well in the center. Place the butter, salt, sugar and egg into the well. Using your fingertips, mix and cream these ingredients together. Then, little by little, draw in the flour to work the dough until it has a grainy texture. Add the milk and incorporate gently with your fingertips until the dough begins to hold together. Knead the dough about 5 times by pushing the dough away from you until it is smooth. Roll the bottom crust to fit a 9-inch pan, and cut the top crust as a lattice, approximately 1-inch in width. Chill the rolled crust while you prepare the salted caramel and apple filling. Place the sugar, hot water, and salt in a heavy saucepan with a tight-fitting lid. Pour in the water and sugar, making sure to keep the sugar crystals from splashing around the sides of the pan. Place pan over low heat and stir with a wooden spoon until the sugar is dissolved. Your goal will be to try and dissolve the sugar become it comes to a boil. Cover the pan, turn the heat to medium, and cook for 5 minutes. Uncover and continue to cook the sugar until it starts to take on some color. Keep cooking until the sugar starts to smoke a little and turns deep mahogany brown. Remove pan from the heat and pour in about 1/4 cup of the hot cream, stirring with a long-handled wooden spoon.. The caramel will bubble, so watch out. Keep stirring and slowly add the remaining cream. Strain the caramel sauce through a fine-mesh strainer. Let cool. Melt butter in a large saute pan set over medium-high heat and add apples to the pan. Stir to coat fruit with butter and cook, stirring occasionally. Meanwhile, whisk together the spices, salt and .75 cup sugar, and sprinkle this over the pan, stirring to combine. Lower heat and cook until apples have started to soften but not completely soft, approximately 5 to 7 minutes. Sprinkle the flour and cornstarch over the apples and continue to cook, stirring occasionally, another 3 to 4 minutes. Remove pan from heat, add cider vinegar, stir and scrape fruit mixture into a bowl and allow to cool completely. Gather your rolled pie crust, salted caramel, and apple mixture. Begin by layering 1/3 of the apples in the bottom of the crust so that there are minimal gaps. Pour 1/3 of the caramel over the apples. Add 1/3 of the apples and caramel for a second layer, and then add a third layer of apples, and then the caramel again. Assemble the lattice crust and flute the edges of the crust. Pour the last bit of caramel on top. Brush the crust with the beaten egg and lightly sprinkle with raw sugar and sea salt. Bake the pie on a baking sheet larger than the pie pan for 20 minutes . Reduce the oven temperature to 350 degrees, lightly cover with foil and bake for another 25 to 30 minutes. Remove foil and bake a little longer if your crust is not nicely browned. I haven't given up on my dream to master baking and in turn created this delicious mango curd tart from Zoë Francois over at ZoëBakes. I follow Zoë on Instagram and she has the best tutorials and instructions on becoming the pastry chef/baker that you have always dreamed of becoming. For this particular recipe I gain interest from my recent trip back home. My parents and I went to Bywater American Bistro to try out Nina Compton's brand new restaurant and I was blown away by every course, but particularly the dessert. It was peaches with granita, meringue, coriander seeds and flowers. Yeah, a lot going on but SO good! The waiter described it as something different but delicious, that it was hard to put together a description. Adventurous, we were sold. For my spin on the recipe, I topped the tart with a delicious lime granita, meringue sheets and toasted cracked coriander seeds. This tart was tasty and satisfied my savory tastebuds. The perfect balance. Bring the water and sugar to a boil in medium saucepan, making stirring until sugar is dissolved. Once syrup is cooled, stir in lime juice. Transfer syrup to a baking dish. Cover with plastic wrap and place in freezer. Stir every 45 minutes until frozen, about 3 hours. Preheat oven to 200°degrees. Line a rimmmed bring sheet with parchment paper. In the bowl of a stand mixer fitted with the whisk attachment, beat the egg whites at high speed until the mixture goes from clear and foamy to white. Turn the mixer speed down to low and slowly add the confectioner’s sugar, granulated sugar, and cornstarch. Scrape down the sides of the mixer, then turn the speed back up to high and beat to stiff peaks. Spread the meringue out on the prepared sheet pan to roughly 1/2 inch thickness. Bake the meringue until dry and crisp, about 60 to 70 minutes. In a Stand Mixer cream the butter and sugar. Then add the yolk and mix to combine. Add the flour and salt, blend until it comes together. Press the dough into a 9 to 10-inch tart pan or form dough into a disk and wrap in plastic. Refrigerate for at least an hour. Fill the tart shell with foil and baking beans. Bake for about 20 to 25 minutes or the crust looks golden on the edge. Remove the foil and continue to bake until the tart shell is golden on the bottom. In a bowl set over a double boiler, mix together the mango, lime, sugar, salt and yolks. Use a rubber spatula to stir it until it starts to thicken. Then stir in the butter. Once it is thick, strain the curd. Pour the curd into the prepared tart shell and bake at 325°F until the curd is set, 15-20 minutes. Let cool and then refrigerate. Serve with meringue pieces, granita, and cracked coriander. Don't you love all of the summer produce popping up all over? This tomato tart screams fresh ripe tomatoes, fresh herbs, buttery puff pastry and a delicious addictive mayo mixed with grated fontina and parmesan cheese. I decided to take the ever so popular southern tomato pie and make it in tart form. The recipe is adapted from Vivian Howard who is known for her amazing tomato pies. I have a warning for you, this tomato tart is addictive! Since tomatoes produce a lot of liquid, the last thing we want is our puff pastry super soggy, so make sure to slice your tomatoes and toss them in a little bite of salt and sugar, place in a colander, and let sit. After a few minutes, you will see all of the extracted water in the bowl that was released. Blot the tomatoes with paper towels to remove the excess water and you are good to go. You can use what ever tomatoes you can get your hands on for this recipe. Also, get creative on different cheeses as well, you really have nothing to lose. Take the tomatoes and toss with the sugar and kosher salt. Place in a colander over a bowl and let sit for 20 minutes. While the tomatoes sit, make your caramelized onions. In a skillet, add the butter and onions. Cook the onions over medium-low heat until caramelized. 25-30 minutes. After 20 minutes, blot tomatoes with paper towels to remove excess water, place aside. Place a sheet of parchment paper on sheet pan and place puff pastry sheet on top. Prick dough all over with a fork, leaving a 1/4 -inch boarder around the edge. Spread mayo mixture on bottom of the puff pastry. Top with the tomatoes, caramelized onions and a few more dollops of the mayo mixture. Mix together egg and half and half, brush the edges with egg wash. Bake for 15 to 20 minutes until edges are lightly browned and cheese melted. Garnish with freshly torn basil. Shrimp and Clams in a smokey roasted tomato broth is all sorts of good! Grab a bottle of wine and some nice crusty bread and you have a delicious meal in as little as 15 minutes. This dish is one of my favorites to make. Quick, easy and not short on flavor. I had the pleasure to partner with Sea To Table and use their delicious sustainable seafood that is nothing short on quailty. For this recipe I used Sea To Table Wild Gulf Shrimp. Once it hit the hot butter, the sweet aroma brought me back to the shrimp back home in NOLA. One of the great things about Sea To Table’s Wild Gulf Shrimp is that it is traceable. Upon receipt, on the label it states the species, how it was caught and where. Which I think is amazing. What is better than knowing where your food comes from?? You only have 4 main ingredients. Wild gulf shrimp, clams, roasted tomato butter, and wine. For the compound butter I took room temperature butter and added finely minced roasted tomatoes, parsley, garlic, smoked paprika, lemon zest, lemon juice, salt and black pepper. If I were you, I would make a nice size batch, wrap it in some wax paper and store it in the freezer. It is addicting and perfect to pair with some steak or toss with hot pasta. Don't forget to check out Sea To Table's other great sustainable seafood offerings! In a small bowl combine the butter, tomatoes, parsley, garlic, smoked paprika, salt, lemon zest, lemon juice and black pepper. Combine well and then place aside. If you want to improve your roast chicken game, make this recipe. Roasted saffron lemon chicken has. changed. my. life. period. I don't cook much with saffron but I think I may need to changed that. This recipe came from Savuer Magazine, right smack on the front cover. It has made its way from my coffee table, to bathroom, to a corner somewhere and then back to my coffee table. I have glanced at the recipe many times but finally decided to make it--so glad I did. I do not roast chicken often, but I was intrigued to give it a shot. For this particular recipe I followed the Zuni Cafe method for roasting chicken. You salt your bird for 2-3 days. I did not have that much time, but salted it overnight and still had great results. Since I salted my chicken, I omitted the salt in the recipe and just muddled together the saffron and black pepper. Brought my chicken up room temperature, grabbed a few lemon slices, rosemary sprigs and tucked it until the skin and into the cavity. Very hot oven, like 450 degrees breast side up for 30 minutes. Flip and then cook for another 20-25 minutes and flip again, breast side up for another 10-15 minutes. The best part? The gravy. Have this with some delicious roasted potatoes and tzatziki or lemony yogurt on the side and everyone will love you. Measure out 3/4 teaspoon of salt for every pound of chicken. Slide a finger under the skin of each of the breasts, making 2 little pockets. Now use the tip of your finger to gently loosen a pocket of skin on the outside of the thickest section of each thigh Rub the outside of the chicken with the salt mixture, making sure to get under the wings and drumsticks and sprinkling heavily over the thicker parts of the breasts and thighs. Twist and tuck the wing tips behind the shoulders. The chicken should be covered, but still with some air circulation around the bird. Chill for up to 3 days in the refrigerator. (I let the chicken dry-brine for 1 day and it came out moist). Cook saffron lightly in a dry skillet until fragrant, 1-2 minutes. Let cool and transfer to a mortar and pestle. Add the black peppercorns and grind into a coarse powder. Wipe chicken dry and slide fingers under the skin of chicken breast and rub spices over and under the skin, and inside the cavity. Place rosemary and lemon slices under the skin and inside the cavity. Tie the legs together using butchers twine. Preheat the pan roasting pan over medium heat. Place the chicken breast side up in the pan. It should sizzle. Place the chicken in the pan in the center of the oven and listen and watch for it to start browning within 20 minutes. If it doesn’t, raise the temperature progressively until it does. The skin should blister, but if the chicken begins to char, or the fat is smoking, reduce temperature by 25 degrees. After about 30 minutes, turn the bird over — drying the bird and preheating the pan should keep the skin from sticking. Roast for another 10 to 20 minutes, depending on size, then flip back over to recrisp the breast skin, another 5 to 10 minutes. The chicken is done once an instant-read thermometer inserted into the thickest part of the thigh reads 165º, let rest for 10 minutes before carving. Lift the chicken from the roasting pan and set on a plate. Carefully remove the clear fat and leave the drippings. Add about a tablespoon of water to the hot pan and the butter. Whisk and add 1 teaspoon minced rosemary. Serve chicken with your sides of choice and the pan drippings. If you never had wagyu steak, you are missing out! This wagyu chuck steak is served with a tangy sweet tomato bacon and balsamic relish with blistered tomatoes. Lone Mountain Wagyu provides all your wagyu needs and have extremely great quaility products. I was quite surprised how well packaged the product came. The attention to detail to make sure it was received with care was spot on. These are Fullblood Wagyu Chuck Steaks and the marbling is out-of-this-world! They are wet aged for 56 days and have amazing flavor! When cooking these steaks, you want to give them a quick sear and have them medium rare or you can braise them until tender. The great thing about this recipe is that it is put together quickly. The sauce with blistered tomatoes poured on top of the wagyu chuck steak is a treat. Top it off with some freshly torn basil and you have yourself a delicious meal! Be sure to check out Lone Mountain Wagyu for more delicious cuts of meat and recipes. In a heavy duty cast iron skillet, over medium-high heat, render bacon stirring occasionally for 10-12 minutes until nice and crispy. Scoop bacon out from skillet, reserve and leave 1 tablespoon of fat. Raise the heat back up to medium-high and add the tomatoes. Cook until the tomatoes are lightly charred and about to burst, 5-6 minutes. Add the garlic, reserved bacon, balsamic vinegar, brown sugar, black pepper and a salt. Stir and reduce for 5-6 minutes. Remove from heat, place in a container and keep warm. Let steaks come to room temperature before cooking. Season both sides with salt and black pepper. Heat cast iron skillet over over high heat just until smoking. Add oil and then carefully add steak. Cook for 3 minutes on 1 side undisturbed and then 1-1 1/2 minutes on the other. Repeat with other steak. Slice steak against the grain and serve with the warm tomato, bacon and balsamic relish and fresh torn basil. Depending on desired doneness, steaks may need to cook for longer period. Can be braised until tender. The summer heat is upon us and this gazpacho with seared scallops is so good! Flavored packed recipe that is perfect to cool down with. If you never have tried gazpacho before now is the time! Some people are put off by a "cold soup" but it is light and refreshing. Originating from Andalusia, Spain, gazpacho is a mostly vegetable base. There are some versions that will even incorporate fruit such as grapes and strawberries. As always, I love texture and decided to make a light and refreshing tomato salad to spoon on top--and the showstopper sear scallops! If you are looking for a delicious and opening star for your next dinner, this recipe is a must make! In a blender combine the tomatoes, celery, cucumber, garlic, bread, parsley, sherry vinegar, olive oil, salt and black pepper. Blend on high speed until smooth. If your blender cannot hold all of the ingredients, blend in batches. Taste and adjust seasonings. Serve with the tomato relish, seared scallops and a drizzle of more olive oil. Combine the tomatoes, cucumber, fresno, olive oil, sherry vinegar, salt and pepper. Toss and let sit for 10 minutes to marinate. When ready for serve, toss in avocado and spoon on top of gazpacho. Make sure to pull the muscle that is attached to scallops on the side (it will be tough) Place scallops on paper towels and "dry out" in the refrigerator for 20 minutes. Your goal is to make sure a good bit of the moisture if gone--which equals a great sear. Take scallops from out of the refrigerator and pat dry again and sprinkle with some kosher salt. Preheat a heavy bottom cast iron skillet with grapeseed oil over medium-high heat (to where it is starting to smoke). Gently add scallops making sure to not overcrowd the pan and cook undisturbed for 2-3 minutes. You should start to see a golden ring form (the crust). Take a spatula and flip one scallop to see if it is to your liking. Once the golden crust forms, flip all scallops and cook for 1 minute on the other side and serve. (You want to briefly cook it on the other side). *This post has been created in Partnership with the American Lamb Board. You need to stop what your doing and go out and hunt for some delicious lamb ribs! They are hard to come by, so make sure to check in with your local grocery store or butcher to special order for you. They are worth it! This is another recipe in partnership the American Lamb Board, be sure to check out their site for more delicious lamb recipes. I first had lamb ribs working at a restaurant and was blown away by them. For one, it was the first time I've ever seen them. Secondly, back then I wasn't really a lamb fan as I am now, but working at the restaurant my goal was to try any and everything--and I'm glad I tried the lamb ribs. I need to let y'all know that they were baked until tender and then dredged in a tempura batter and fried, so yeah, hard to pass that up. For this recipe, it is crucial to make sure you trim any excess fat and render as much fat during the cooking process. Lamb ribs have a reputation for being too fatty, but make sure you get a rack with a good ratio of meat to fat. These ribs were seasoned with a Caribbean inspired dry spice rub, sprinkled with brown sugar and wrapped in foil with some aromatics from fresh thyme and green onions. Slow baked for 2 1/2 hours and then topped with a delicious mango chutney sauce. Serve with some coconut rice or plantains and you have a great dinner ahead. To make the mango chutney, melt the coconut oil over medium-high heat and add the ginger, bell pepper and serrano chiles. Sauté for 4-5 minutes and then add the mango and continue to cook for another 5 minutes. Add the sugar, apple cider vinegar and salt. Bring to a boil, reduce the heat and cook for another 10-12 minutes. You want the mango to start breaking down but not too much. Add the lime, cilantro stir and remove from heat. Combine all the spices and rub all over the lamb racks front and back. Let rest for 20 minutes. While your lamb is resting, take a piece of heavy duty foil, large enough to wrap each lamb rack in separately and place on a sheet pan. Divide the brown sugar and rub 3 tablespoons on each rack front and back. Any seasoning and sugar that fell off the lamb, make sure to add it on the bottom of the foil. Place the lamb rack on top of the foil and lay your green onions and thyme on top. Sprinkle any left over sugar on top and wrap tightly. Repeat with other rack of lamb. Cook lamb for 2 1/2 to 3 hours. A lot of fat should have rendered out. You can either remove from oven, blot excess fat off and cook under the broiler for 2 minutes or serve right away. Serve with mango chutney. I love tacos! I must admit, I was team flour tortillas for years until I moved out to Texas and became team corn tortillas. These corn tortillas have wonderful cilantro added to them. The process is quite simple and I really enjoyed the herbaceous flavor of cilantro. I took some cilantro, blanched them in water and then shocked them in some ice water to stop the cooking. After that, I reserved around 1 tablespoon and rough chopped it and then pureed the rest. That is it. Masa, water and the puree and then you have delicious corn tortillas for your next taco Tuesday fiesta. You can pair this with my Coffee Ancho Sous Vide Short Ribs. Do not worry if you don't own a sous vide machine, you can braise the ribs the old fashioned way, in the oven. Prepare a bowl with ice and water, place aside. Bring a pot with water to a boil. Tear off top of cilantro bunch and blanch for 1 minute until it turns bright green. Scoop out cilantro and place in the prepared ice bath to stop the cooking. Rough chop 2 tablespoons of cilantro and reserve. Place rest of cilantro in blender with 1 cup warm water. Blend for 2-3 minutes. * The water should turn bright green. While your dough is resting, start pre heating a griddle or cast iron skillet over medium-heat. Cut two squares of medium-heavy plastic to fit the press. A freezer bag or plastic bag laying around would work. Wet the bottom of the tortilla press just a tad and place one sheet of plastic on bottom. Take a small bit of the masa and roll it into a golf ball size. Place the second piece of plastic on top of the masa and then press down on the press with the handle, making sure to add even pressure. Peel the top plastic from the tortilla. The tortilla should be 5 inches in diameter. Lift up tortilla carefully from press and remove the plastic. Gently place on pre-heated griddle and cook for 15 seconds, you want the edges to turn light brown. Cook tortilla on the second side until brown spots start to show and no longer looks moist, about 45 seconds more, then flip again. Firmly press the tortilla with your fingertips, it should puff up a little bit. Transfer to a napkin-lined basket and cover. Repeat. In my experiences, there have always been leftovers after a seafood boil. Its better to always have too much because the leftovers are just as good! For this creamy crab boil potato salad I added red potatoes, corn, shrimp, green beans and seasonings to a creamy buttermilk dressing. The dressing has a little bit of the seafood boil seasonings from the package, buttermilk, mayo and some creole mustard (spicy brown mustard can be used as well). This creamy crab boil potato salad would be great to bring to your next picnic or grill out! One thing to keep in mind is not to over cook your ingredients. Make sure the potatoes still have some integrity. The corn and green beans a nice crunch and snap to them. I love to add the seasoning blend and liquid crab boil to my liquid. For this recipe I used the Zatarains pro boil seasoning pack. Some aromatics such as onions, garlic, lemons and that was that. Make sure to taste your liquid to make sure it is seasoned to your liking. We want all that flavor to penetrate out ingredients. A lot of times the packets are for a large batch to boil, but since this is a small batch of items, cut the recipe in half. For me, always with boils I taste and season my water as I go until I reach the right amount of spice and salt. 1 1/2 pound small red potatoes. If not using leftovers from a boil, follow instructions on boil packet (cut the recipe in half since we are not boiling 15lbs of delicious seafood) Once you added your water and seasoning, toss in the onion, lemons and celery. Add 2 capfuls of crab boil if using and bring to a boil. Taste and adjust seasoning to your liking. If you want a little more heat, add a pinch of cayenne pepper. Prepare a bowl with water and ice, place aside. Toss in the potatoes and boil until fork tender, 10-15 minutes, scoop out and let cool. When the potatoes are cool enough to handle, cut them in quarters or in half, place aside. Add the corn and cook for 8-10 minutes, remove and let cool. Shuck corn and place aside. Add green beans and cook for 4-5 minutes, remove and plunge in a ice bath to stop the cooking and keep the bright green color and then remove once cooled. Make sure liquid is brought back up to a boil and add your shrimp. Cook for 2 minutes, remove from heat and let sit for another 2 minutes. Drain well. Meanwhile, in a bowl combine the mayo, buttermilk, creole mustard, seasoning, lemon juice, salt and mix well. Add the potatoes, corn, green beans, shrimp, onions, celery and green onions. Combine and enjoy.